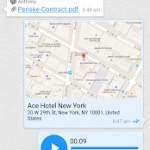 FreshTeam is a messaging app that saves mobile teams time. 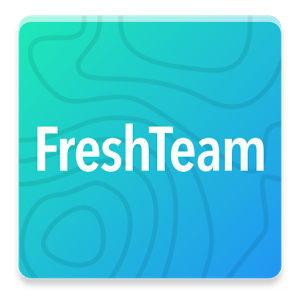 You see your team on a map, have group calls, and do other amazing things not possible with texts or email.Connect with colleagues with your FreshTeam username. Phone numbers are not necessary. · Use the map tab to view where your team is located right now. You only share your location when you want and with whom you want. 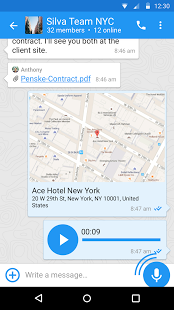 · Create groups to chat and have conference calls with HD sound. No more dial-in numbers and pins. · The group creator names the group, adds members, and more. The group creator can give other group members these powers by making them administrators. · New group members see the group’s discussion from before they joined. It’s easy for new group members to catch up. · Send voice notes when you can’t type. Tap the mic button in a chat. 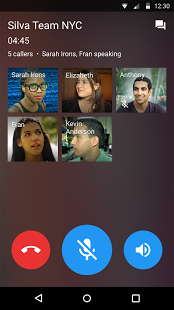 · Make a phone or video call to any user in one tap. One tap to start or join a conference call. No more worrying about phone numbers and dial-ins. · Send files, photos, and videos from any other app to FreshTeam users and groups. Just open the file, and tap the open-in icon. Optional group call recording! 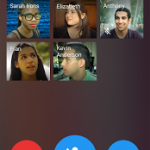 To record a group call, start the call, and then tap record when you wish to begin recording. Participants are notified the call is recorded. The recording is posted to the group after the call. It’s a great way to keep team members who can’t participate up to date, and to have records of your important calls.